Rakhi.in is offering online rakhi delivery to Kanpur and many more places. 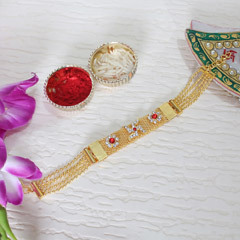 This web portal is showcasing thousands of premium rakhi designs at amazing price. Send Rakhi to Kanpur for your long distant brother and let him feel the joy of Rakhi celebration despite long distance. Avail online Rakhi delivery to Kanpur without any hassles. Rakhi or Raksha Bandhan is one of the most celebrated festivals of India and sought after by all brothers and sisters. It’s not only celebrated among Hindus communities but Sikh families also rejoice this beautiful fest with full fervor and zeal. There is a certain way of celebrating this festival and as per the customs, sister ties a Rakhi (silken thread of love and care) and brother in return gives her gifts of her choice. As the fest signifies the bond of protection, brothers pledge their sisters to protect them from all evils throughout the life. If you want to mesmerize your brother or sister this Rakhi then send Rakhi to Kanpur and Rakhi gifts in all nooks and corners of the city. Rakhi.in is offering unique designs of Rakhi sets that show the perfect blend of old tradition and modern styles. Rakhi.in offers beautiful Rakhi on sale exclusively for Kanpur! 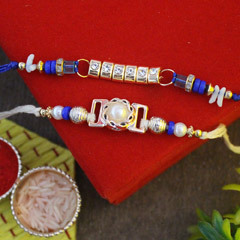 This portal gives you a lot of options when it comes to find the right Rakhi gifts to be sent to Kanpur. Simply check out these best selling Rakhi collections that includes fancy Rakhi threads, multi-coloured Rakhi, zari-zardosi Rakhi, pearl Rakhi and so on. One can also choose to send Rakhi with sweets if your brother has a sweet tooth. Send Rakhi with Dry fruits if your brother is health conscious and avoid sugary foods. 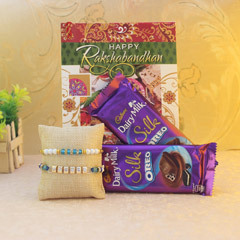 Kanpur Rakhi gifts categories includes amazing gift hampers where fancy Rakhi is delightfully paired with Indian sweets, premium chocolates and crunchy dry fruits along with perfect touch of love and warmth. Send Rakhi gifts to Kanpur and make a lasting impression on your sweet bro. So what are you wondering when you are getting best facility of Rakhi delivery in Kanpur. This facility offers you the ease to send Rakhi to Kanpur with utmost ease. Hurry to visit the range that is full of attractive Rakhi online with many amazing Rakhi gift hampers as well as Rakhi gifts too. You can send Rakhi to Lajpatnagar, Panki, Ashok Nagar, Azad Nagar, Mall Road, Khalsi Line, Shanti Nagar, VIP Road, Indrapuri Road, Faizal Ganj, Ghumni Bazar and many other places.